Sebastian's Institute of English, IELTS Training Centre, MANJERI, Kerala. Founded in 1979, Institute of English is a Centre of Excellence for English Teaching and Training at various levels. The Institute, ever since its inception, has been preparing students for taking various University examinations related to English Language and Literature. We also been coaching candidates to take various national and International English language efficiency tests like IELTS, TOEFL, PTE, Creative ELT, Communicative English, Interview Training & Personality Development. Method of teaching is scientific, up-to-date and student-friendly. The Institute inspires a passion for real English in all learners. Course outline:- Fluency Development, Speech Generating Techniques, Vocabulary Building, Confidence Building, Writing, Reading, Listening, Debate, Interview Practice, Personality Development, Group Discussion, Public-speaking, Dress Code, Body language tips. IELTS Band Score of our Recent Test takers: 8.0, 7.5, 7.0, 6.5. The institute with its long years of experience in English Education can give effective and efficient coaching to IELTS candidates (Academic & General). The intensive coaching in the four modules (Speaking, Listening, Reading & Writing) enables the candidate to get a good score in the IELTS examination. Regular, Full time and Part time classes available. Sunday and holiday batches for working professionals. Free study materials provided. Hostel facility available for Girls. Boys can find lodging facility near the institute. Exam Registration: We are the Authorized Registration Centre from IDP & British Council for IELTS Exam. Exam Fee: 12,100.00 INR (inclusive GST). This fee includes Exam fee and Course Material with CD. Coaching fee should be paid separate. 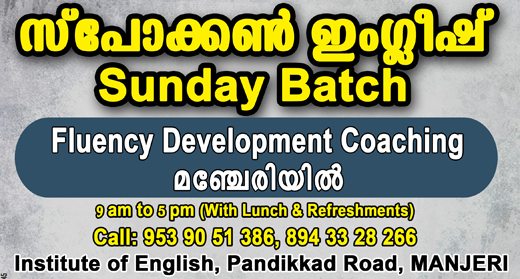 Special English class for School & Higher Secondary Students (CBSE & Kerala Board). Morning, evening and holiday batches available.